So, back. At last. I'll gradually be re-uploading previous albums – in batches probably – if any of you have specific titles you want sooner rather than later, then drop me a line. (You'll notice unavailable titles have download links with strike-throughs, available ones don't). As you all know I was going to post 'Sholay' at this point - but for several reasons (last month's mess being one, the fact that I haven't actually had time to rip it being another) I'm holding back for a bit. Check comments on the previous post for an alternate source though. In the meantime... here's a Kalyanji Anandji score that , to my knowledge, doesn't turn up very often. 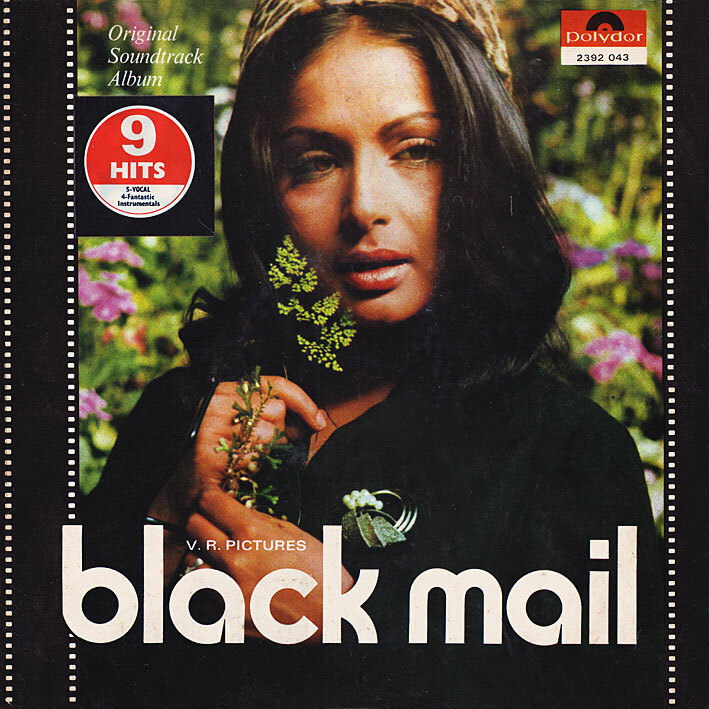 'Black Mail' is from just before the brothers really started getting into the funk and all that, but still good. 'Naina Mere Rang Bhare' is a pretty, poppy Lata Mangeshkar number that I'm quite fond of, 'Pal Pal Dil Ke Paas' has a nice backbeat going on (and is that a Melodica on the instrumental version?) – the highlight however is the super groovy 'Mile Mile Do Badan'; it's awesome! Y'all having a good summer? Hi, great to see you are back. Can't wait to hear some new stuff. I am afraid I'm having trouble with the download... about 49mb of it loads, but then it stops, and I n ever get to see the download link. Whoops! I finally got it to work after about the fourth try. Ah, good :-) My server's been wonky all evening so I haven't been able to try it myself. Thanks PC for reuploading this...The bass is very good..